The ball of tape appears to be a little over a foot in diameter and was densely packed together to weigh roughly 60 pounds. Will the bullet be able to penetrate the ball of tape? 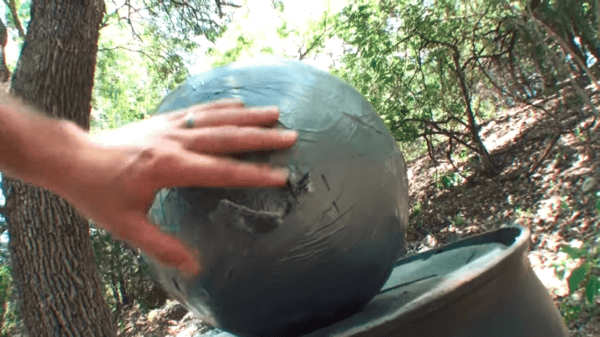 YouTuber Demolition Ranch, also known as Matt, says he received the huge ball of duct tape from a viewer who asked him if he could put that dense ball of tape to good use. After spending a great deal of time and some money into it, he didn’t know what to do with it. 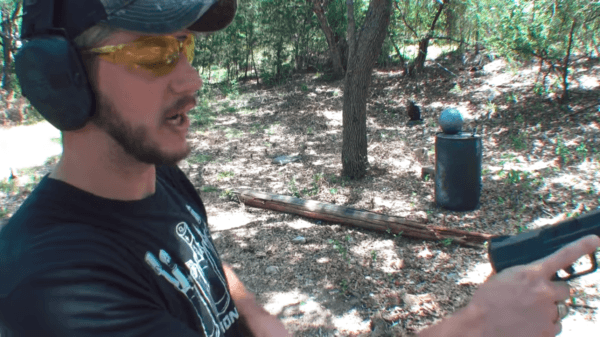 So the YouTuber gets into action, trying to find out how the solid ball of duct tape responded to two different kinds of bullets. The first round is a 9mm that pierces the balk but fails to penetrate it. In order to find out how far the bullet went, he starts digging a hole in the ball but ultimately doesn’t succeed. 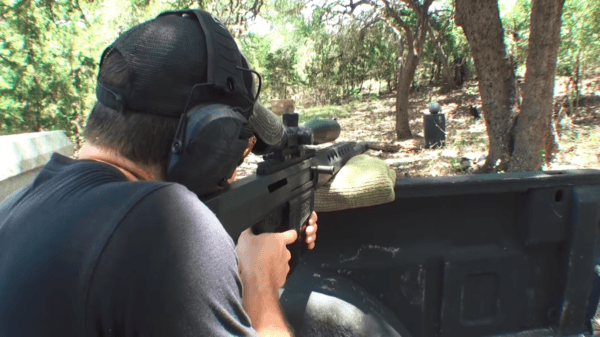 The next round he tries out is a .50 Cal BMG that manages to penetrate the ball. There are two views of the second shooting, just to show the viewers what it is like when the bullet penetrates the ball of duct tape. The .50 Cal BMG is a machine gun cartridge developed for the Browning .50 caliber machine gun in the late 1910’s. The cartridge has been used in most of the wars in history, from World War II to the Vietnam War to the Iraq War and most recently in the Saudi-led intervention in Yemen. The .50 Cal BMG cartridge is also used in long-range target and anti-material rifles, as well as other .50-caliber machine guns. A wide variety of ammunition is available today compared to the past, and the availability of match grade ammunition has improved the efficiency of .50 caliber rifles by enabling more accurate fire than lower quality rounds. The .50 Cal BMG was developed by John Browning, who, during the World War I, realized the need for an anti-aircraft weapon. So powerful is the cartridge that there are rumors its shockwave is enough to kill. Even though many claims and experiments have dispelled that myth, don’t let it fool you. The round is immensely powerful, with an 800-grain bullet generating around 15,000 ft-lbs of energy. US Marine sniper Carlos Hathcock set a record in 1967 for a long-distance kill at 2,286 yards with a .50 BMG fired from the M2 Browning Machine Gun. One of the most impressive records still remains that of Canadian Army Corporal Rob Furlong shooting a Taliban combatant at 2,657 yards with a McMillan Tac-50 chambered in .50 BMG. In mid-2017, it was reported that a Joint Task Force 2 sniper used a McMillan Tac-50 chambered in .50 BMG and killed an insurgent. Experiments like the one above are dangerous, and should not be attempted by just anyone.